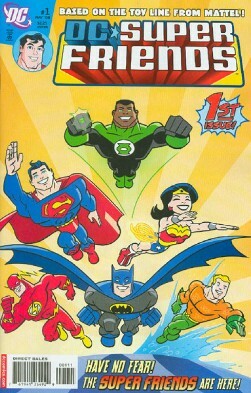 Roll Call: Superman, Aquaman, Green Lantern: John Stewart, Wonder Woman, Flash, and the Batman. A school field trip had gone awry. Trapped with no way out of a deep underground cavern after an aggressive earthquake. The Batman appears from the shadows and radios the other Super Friends. Publicity and heaving crowds greet the heroes and the rescued children. A mysterious man approaches and reveals he has made several advancements in science, but who is he? The Super Friends' expressions are blank, but the man reveals he is Professor Ivo and that every attempt to be rich, famous and live forever has been disrupted by the glory-hogging heroes. Wonder Woman�apologizes�if their actions have upset him by Ivo is stern and introduces his greatest invention: Amazo! An android with all the powers of the Super Friends! Flash can't outrace him. Green Lantern has less emerald energy than him, Wonder Woman is weaker and he even has Superman's arctic breath! Combining all his powers Amazo is able to trap the Super Friends in a super dense emerald cage! Superman and Wonder Woman can't bend the bars. Batman can't deduce any clues, Aquaman's aqua powers can't help, Green Lantern can't drill his way out and the bars are so super dense Flash can't vibrate out! Batman knows they cannot admit defeat, Wonder Woman agrees, Green Lantern also, Aquaman too. Flash, not feeling the love is about to joke when an aftershock rocks the city! Wonder Woman has been thinking hard and�realizes�Amazo has a weakness they hadn't�realized! Green Lantern may have a super powered ring Amazo can surpass but it is powered by John's iron will. A will so strong, if he believes in himself, he'll be strong enough to triumph over adversity. Diana shows her belief by placing her hand on John's fist. Superman follows, then Flash, Batman and Aquaman. All together they smash the cage apart in an almighty blast of Super Willpower. As the heroes race to help civilians Arthur reveals he has a way to fight Amazo once and for all. In the meantime, Professor Ivo and Amazo are preparing for their television debut in a studio but just before filming, the news interrupts with news of the Super Friends stopping the earthquake and rescuing survivors. Ivo instructs Amazo to fight the Super Friends but this time they are ready! Batman in his Batwing plane traps Amazo in a wire net. While distracted, the android is caught by Superman's Superplane Magno Claw hurling him through the air, back and forth. Ivo growls that Amazo is more powerful than all the Friends, but Arthur begs to differ. If Amazo is so amazing, why hasn't he used any aqua powers? Ivo orders Amazo to dive into the nearest lake so he can challenge Aquaman. A short circuit! With the discharge of power, no more Amazo! Professor Ivo is now behind bars, but before he can serve his sentence he asks the Super Friends why he failed. Wonder Woman points out, his mistake was thinking heroes are defined by their powers. John chips in too, helping people makes you a hero and never giving up. Ivo isn't listening to sanctimonious speeches. He swears to rebuild Amazo and seek revenge one day... with a waterproof android! Wonder Woman invites you to then become a Super Friend. Batman tells you how to be a Super Friend. Be kind, show respect and help out. HO NOYO XOLI ISDO CBY K RSXBPKEY YBEXR-EV! Superman Fact File, "Help Superman Come To Earth" Game, Super Friends Emergency Monitor Kit, Super Friends Code Kit. Story - 4: Yes it's an evil book saturated in a blatant attempt to brainwash children, and force adults into shopping for repaints of toys - get over it. Before I get hate mail, DCU mainstream are doing exactly the same now with�DC Direct. I loved the original cartoon series, the toys and such. The revamped comic, reviving Super Friends around a super deformed toy line bothered me deeply - at first. The poorly hidden moral messages and words of wisdom, friendship and faith are delivered with all the subtlety of a punch in the face - however - it is actually a really, really good book. It's safe for kids, has activities for them aside from the story, has approachable art and characters. If you are willing to return to the age when the Justice League really were Super Friends - you WILL enjoy this. The book is quite obviously an attempt to revive the Super Friends cartoon show, throw in political correctness and of course advertise a minimum of four toys per chapter. The writers will have their work cut out for them! Art - 3: I am very used to the Timmverse now after reviewing all the DCUA books for so many years and honestly when I saw the preview I was horrified. (I was also horrified by the toy line itself but that's another issue.) However I'm surprised how easy it is to embrace the styling of the book. I'll still need a while to get used to it but it's not horrifying by any stretch. Cover Art - 2: Didn't like the cover. Unlike the interior art it isn't of a unique style - it just looks like Bruce Timm designs after horse steroid injections. For the launch issue, they could have tried much harder and delivered something much more appealing.